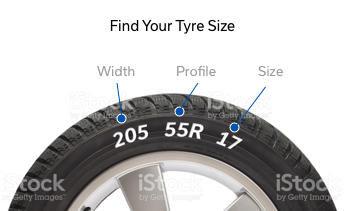 HOW DO I FIND TYRE SIZE? We’ll look after you for the life of your tyres. Enter your Tyre Size above to get started. What happens when I buy Tyres from Mag & Turbo? When you buy Tyres from Mag & Turbo you don't just buy tyres. All for the life of the Tyres. 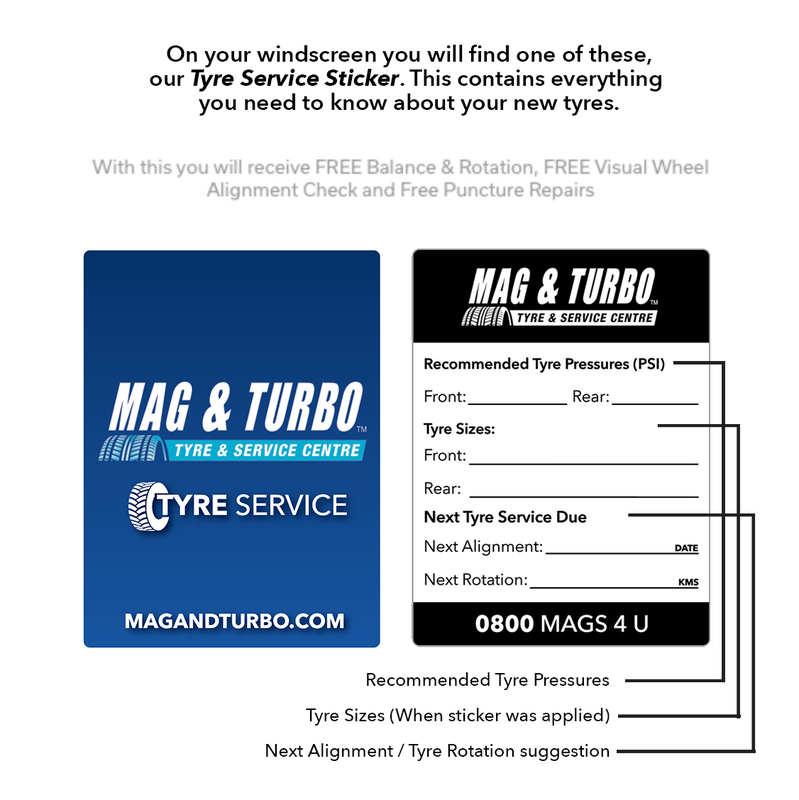 On the sticker you will find your recommended tyre pressure, when your wheel alignment is due and when your tyres will need rotating to ensure the life of the tyres. Most new tyres start out with about 8-9mm of tread. When the tread wears, the tyre’s ability to disperse water reduces. When the tread wears down to less than 2mm, the tyre will likely be unsafe to use and should be replaced as soon as possible. To check this quickly, place a un-lit match into the tread, red side down. If the tread is lower than the red match head, we suggest you replace your tyres as soon as possible as you will not pass your next Warrant of Fitness. How do I know if my tyres are correctly inflated? Under or over-inflating your tyres is dangerous and can lead to excessive tread wear. Look for the manufacturer’s recommended tyre pressure, listed on the sticker usually located on the driver’s side door pillar or fuel flap, or ensure a tyre specialist inflates it for you. Check your tyres weekly, either by yourself or by a tyre specialist. - Pressures should be checked when your tyres are cold. - Pressures should be checked with an accurate tyre gauge. - For heavy loads or sustained high-speed operations, inflation pressures must be increased according to your vehicle’s recommendations. What is the difference between Asymmetrical & Directional Tyres? An asymmetric pattern is designed to blend the requirements of dry grip and water dispersal/snow traction where the tread pattern changes across the face of the tire. An asymmetric tread pattern usually incorporates larger tread ribs/blocks on the outboard side to increase cornering stability on dry roads by offering greater contact area. This also helps to reduce tread squirm and heat buildup on the outside shoulder. The inboard side usually features smaller independent tread blocks to aid wet and/or winter traction when driving straight ahead. Tires featuring asymmetric tread patterns allow using multiple tire rotation patterns. A directional (also called a unidirectional) tread pattern is designed to roll in only one direction. It incorporates lateral grooves on both sides of the tire’s centerline that point in the same direction and result in v-shaped tread blocks. These grooves enhance hydroplaning resistance at high speeds by pumping water more efficiently through the tread pattern. Unless they are dismounted and remounted on their wheels to accommodate use on the other side of the vehicle, directional tires are to be used on one side of the vehicle and are intended to be rotated from the front axle to the rear axle. If different tire sizes are used on the front vs. rear axle, the tires become location-specific and prohibit tire rotation unless remounted. How will a Tyre rotation help me? Tyre rotation is vital to achieving safe tread wear and long tyre life. Tyres can wear differently depending on their position on the vehicle. This can be due to vehicle loading or suspension and steering set up. Rotating your tyres will give a more even wear pattern and prolong tyre life. For maximum tyre life, have your tyres rotated every 10,000 kilometres, or according to the vehicle manufacturer’s recommendations. Misaligned wheels will cause your tyres to wear excessively and irregularly. Having correctly aligned wheels is also essential for safe handling and braking; it can even help to reduce driver fatigue. Have a professional wheel alignment carried out every six months or 10,000 kilometres, whichever comes first. What are the benefits of having my Tyres filled with Nitrogen? Tyres pumped with nitrogen leak two to three times slower than those filled with compressed air and there is no internal oxidisation through eliminated moisture. Nitrogen molecules are also larger than Oxygen molecules, making it hard for them to leak out of the Tyre. Safer more secure all-weather performance. Prevention of internal oxidisation through the elimination of moisture. Not ALL Mag & Turbo stores offer nitrogen filling, so please phone us on 0800 MAGS 4 U to check if your local store does offer Nitrogen Tyre filling.